The general belief that Hastings Town was situated in the valley on the western side of the current Hastings castle, at the time of the Norman Invasion, with a port somewhere to the south of the cliff, has no archaeological basis whatsoever. Critical examination of the available documentary record leads to the inevitable conclusion that Hastings pre Invasion was not where it is now. Applying the rules of evidence as used in a court of Law, the proposal that the accused probably did this or presumably did that, would be thrown out at the first hurdle. Yet we find that diligent historians, whom we have examined, add these words without questioning the validity of their qualifying remarks. The reason for such action is simply because what evidence there is regarding the distant history of Hastings is so incomplete, that most conclusions must ultimately be qualified as guesswork. The fact that the current castle is of Norman construction is not denied, and it is assumed that the town of Hastings would be immediately adjacent to the fortification, for this reason alone. This supposition amounts to a critical error, when examining the history of Hastings, because of it’s unique position in English History. To assume that because other towns developed in this manner means that Hastings did the same does not take into account that Saxon Hastings, or what there was of it, was destroyed at the time of the Norman Invasion. This is clearly one interpretation of the Bayeux Tapestry (97). Further evidence is provided by the fact that there is no entry at all for Hastings in the Doomsday Survey. This is most remarkable and an omission that most people find incredulous when their attention is drawn to it. How could the king’s messengers fail to record the entry for such a famous town, the very town where they landed and camped, if it was not a deliberate act. This is where an obvious truth is clouded by intellectual reasoning, or put into more colloquial English, the eminent historian cannot see the wood for the trees. Those who have taken time to study the Doomsday survey put forward the argument that other towns were omitted from the survey. In consequence a blank page may simply indicate that Hastings was intended to be added at some stage. It is reasoned from this that missing Hastings from the list must therefore have been an oversight. There is of course a far more obvious answer in that Hastings, as a Saxon town, no longer existed, having been destroyed in the course of the occupation. Here is a direct reference to a “new burg”, part held by Robert of Hastings. 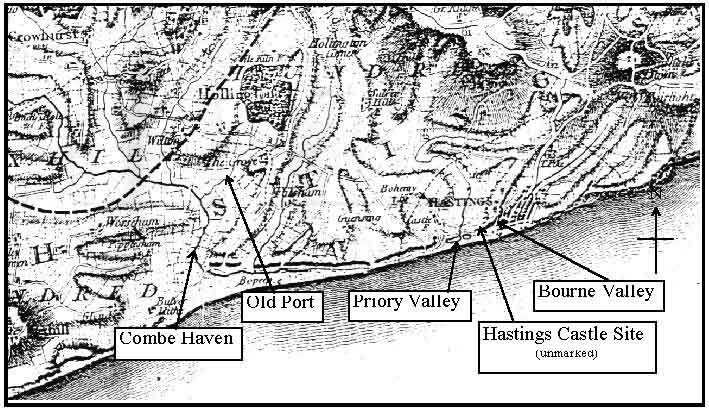 Dawson accepts the point that it is not impossible that this refers to the new town of Hastings, to the East of the castle, in the Bourne valley, which forms part of the present manor of Brede. Further support for this case is the reference to “Nove Hasting” in the Pipe Rolls of 1182,(99) discussing work at the castle of Hastings. A clear reference to new Hastings as opposed to the one that stood there before. In the absence of any other contrary evidence there seems to be a clear case that confirms the existence for a new town of Hastings, at the time the Doomsday information was collected (1085/6). This is subsequently confirmed by the evidence in the Pipe Rolls, but more importantly confirmed by the actual development of the buildings and infrastructure within the town. The earliest reliable maps showing the town of Hastings are dated 1589 (100) and 1610. (101) These two show very little detail, with a Church and the town situated between the second and third of three river outlets. The later of the two maps by John Speede (above right) more clearly positioning the town nearer the third river on the eastern side. This is exactly where the Bourne stream runs today and is known as “the old town”. All the old properties of Hastings are located in the Bourne , including the High Street and a section of the old town wall. It would appear to be a logical conclusion that since the oldest properties are located in this valley this is where the roots of Hastings post Invasion were located. In the Priory Stream valley to the West of the castle there are no buildings pre 1795, other than the Priory itself. It is therefore most likely that the Priory controlled the whole Priory valley, from the date of it’s construction, thus excluding any development until such time as it was destroyed. It was not uncommon for religious houses of the time to exclude the public from their land. The lack of development in the Priory valley indicates this to be the case in Hastings. 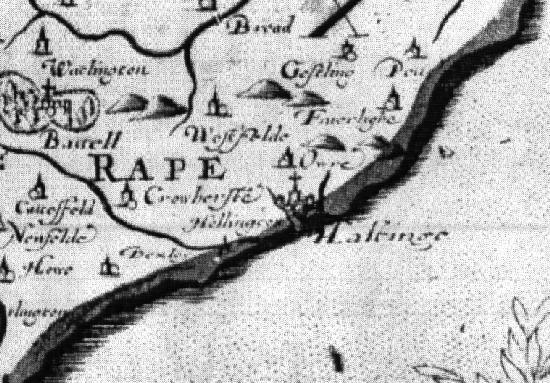 Documentary confirmation that Hastings developed in the Bourne valley is found in the Yeakell and Gardener’s map of Sussex dated 1795 two hundred years later. This is the first reliable map, drawn to approximate scale of 1” to the mile, carefully detailing all properties known at that time. Each property has been meticulously drawn as a black square, showing the development of an active population centre in the Bourne valley. The Priory valley to the west, on the other hand shows a few scattered properties, where the priory itself stood, together with two ponds behind the beach immediately below the castle. There is no other development in the Priory valley and nothing to indicate that there ever was. The ponds themselves form no evidence of the harbour, as archaeological excavations (102) show the water to be an accumulation of drainage water from the Priory stream, which was trapped by shingle moving down the coast. This formed a marsh, which had probably been in existence since at least the 13th century, when the shingle was formed by storms. This raises the question where to look, as there is no doubt that Hastings existed pre 1066. There are several references in the Saxon Chronicle to the “Burgh” of Hastings under the name of “Hastings Ceastre”, as well as the edict of Greatley (103) dated 928. However the use of the word “Ceastre” does not necessarily mean castle, as stated earlier, but is more likely to mean a fortified place. There is no record of any lord or chief, other than the King or Earl of Kent, with jurisdiction in the area. In consequence the likelihood that a true castle existed pre invasion is very small. This conclusion is supported primarily by archaeological evidence conducted in the nineteenth century and reported in full in Dawson’s History of Hastings Castle. He states throughout his book (104) in a number of places that there is an absence of any Anglo-Saxon masonry. He states that the curtain wall “probably dates from shortly after the time when the Castelany, or Castlery, was given to Robert, Count of Eu”. This was after the Invasion. Other difficulties arise in relation to what construction work there was. No evidence of the mandatory Norman keep was found, other than a small hard mortar floor near the cliff(105), on level ground, rather than on the traditional mound. This throws further doubt on the claim that this was the first English castle which William built. The fact that lime was impossible to locate at the time of the Invasion (106) and evidence in the Pipe Rolls shows “lime and stone for the work at Hastings” in the reign of Henry II, provides strong evidence that building work did not start at Hastings Castle until somewhere between 1089 and 1095, a quarter of a century after the Invasion and after the death of the Conqueror. Prior to this time Hastings Castle was I believe located at the old port of Hastings, thus providing a consistent authentic documented record. It is my claim that the Hastings Castle and port of Hastings prior to 1094 or possibly 1095 at the latest, were both located at the place now known as Bulverhythe. I shall seek to show the reader evidence to support this claim, which will provide sufficient interest to warrant a full archaeological investigation, by the necessary authorities. This evidence takes the form of photographs of the site in question, together with photographs of elementary excavations, sufficient to uncover enough proof to warrant independent examination. All excavations were reinstated and nothing has been removed from the site. Indeed such is the age and dilapidation of those things which still exist in the ground that recovery can only be achieved by expert archaeological recovery methods. 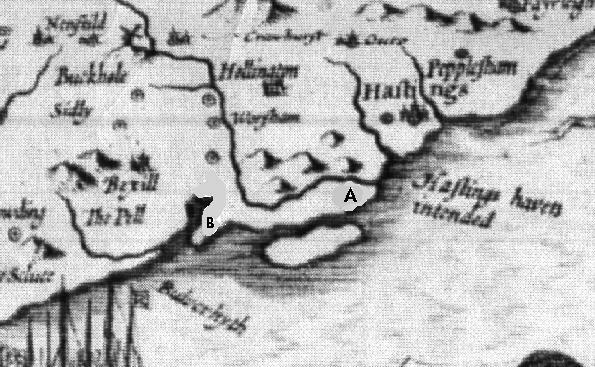 The claim that Hastings town, port and castle were situated on the Bulverhythe prior to approximately 1090 is indirectly supported by the documentary evidence. The castle prior to this date was made of wood. The mistake that historians to this time have made is to assume that the references to castle or ceastre prior to this date are all at the same site as the stone castle of today. One of the prime cases for the belief that Hastings castle was built at the site of William’s camp is given in text by William of Poitiers, who tells us that the Duke “gave the defence of Hastings to an active commander before departing for Romney”. We are also told in the Orderic Vitalis manuscript that this is Humphrey of Tilleul “who had undertaken the custody of the Castle of Hastings from the day of it’s building”. Two interesting points arise from this text, which at first may not be apparent and depend upon the understanding of the chronology of events. There appears to be corroboration of the claim that a castle was built post Invasion, since the named Norman Humphrey of Tilleul could not have been at the start of the building unless it started after the Invasion. This means that there was probably no castle, as we know it, made of stone prior to this point, but Humphrey was put in charge of the defence, as Poitiers informs us, most probably of the town of Hastings. This may at the time have been known as a castle, because it was made of wood exactly as portrayed in the Wace account, but further fortified to accommodate the needs of the day. It was probably only at the end of the 11th century that castles of stone came into existence, so it is wholly consistent for the first Norman castle to be made of wood located at the then port. William landed with a huge flotilla of small ships in the large inland bay which was then known as the port of Hastings. This was accessed through a relatively small tidal entrance opening upon calm water with several miles of shore with adjacent salt pans. This shore was low lying with few advantage points. It had two deep water anchorage’s immediately adjacent to a semi-fortified area that may well have fallen into disrepair (dismantled forts - Carmen). This had wooden buildings scattered along the shore for several miles. The occupants of these buildings fled upon the arrival of the Normans, but in all respects they had landed at what was then known as Hastings. When the Normans arrived they dug a ditch to defend their position and erected their own fort, which William bought with him, made of wood. This was built on a natural mound overlooking the bay and harbour the day of the landing. On the following day a raiding party was sent to Pevensey to consolidate their position. Later the area around the port was fortified and the existing fortifications reinstated. William spent almost a month at Hastings, in which time he built a second fortification at the top of the hill adjacent to his camp giving command of the London road, this became known as the Castle at Hastings after the one by the sea was destroyed. After the Battle William left for London via Rye and Dover having spent just over two weeks at the port after the battle, but not until he had placed his commander Humphrey in charge of the port area, where the camp and “castle” stood. The Chronicles state “There right in front of the port” where William’s fleet “landed stood a Castle handsome and strong” and William allowed knights to enter therein and garrison it for two years. (107) The expression “There right in front of the port” can only make sense when applied to the Hastings port at Bulverhythe, since this is the only place where a castle could stand in a way that you would consider to be in front of the port. It is not correct to dismiss this statement as an error, but provides supportive evidence for Bulverhythe. The great Council in the time of William Rufus was held in 1094 at Hastings Castle. In attendance were the most powerful men in the land. These included Anselm, Bishop of Canterbury, as well as the Bishops and the new King. This gathering was bought together to dedicate Battle Abbey, as it reached completion 28 years after the Invasion, and after the death of the Conqueror in 1087. The register of Battle Abbey records “The Castle then stood below the cliff, on ground since overflowed by the sea”. This can likewise only refer to Bulverhythe as the erosion of the coastline, referred to by many writers, is only recorded to have occurred two centuries later in the late 13th century. There is an inescapable logic that when William decided to build an Abbey at Battle his main representatives, religious or otherwise, who were acting for William, would be accommodated at the site of the camp and castle at the port. This was less than an hour’s walk from the Abbey and perfectly secure. The people there would oversee the project through till completion. At the point of completion of the abbey the reason for the site at Bulverhythe would cease. In common with Norman policy of the time the then lord of the manor, Count Eu, decided to build his own stone castle on the headland. This overlooked and intimidated his citizens in the new borough, now being built in the Bourne valley. The site that he chose was impressive and in perfect tune with Norman thinking. It is only at this stage, after the death of the first Count William of Eu,(108) that his son takes the decision to build a new stone castle on the headland. Once this decision is implemented the area of the wooden castle next to the Bulverhythe would revert to agricultural use, which in turn would have a long term negative effect on the adjacent port. As the Bourne Valley grew in importance, so the wealthier inhabitants migrated down the coast, under the security and watchful eye of their lord. Thus when the great storms of 1294 struck the coast, sweeping across the Bulverhythe entrance, the fate of Hastings port was sealed. The land reverted to agricultural use and for 600 years the original port of Hastings was lost to the world. The last six paragraphs are an attempt to explain what may have happened, given the information that I have found. I believe this to be the only explanation that can successfully account for all the discrepancies that occur when taking the traditional approach. However none of this is worth a pinch of salt if I cannot now show you the site in question. I shall therefore seek to explain the various facets of the site and ultimately compare these to what we should find if all the documents studied carry the correct information. As stated previously this can only apply to the correct site.